lace dew drops and flowers are from my stash. 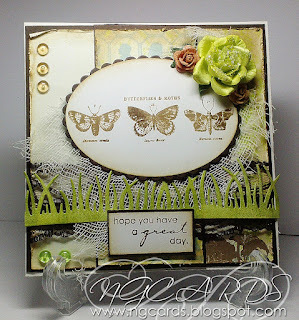 Thanks for joining the 'winged things' challenge at Crafty Cardmakers. Great take on the inspiration piece - your card is sweet! Thank you for joining my Amusing Challenges this week - I'm so happy that you shared your lovely work! I am happy to share my designs & ideas to help you with inspiration. However, please respect my rights by not copying or taking any design shown on this blog and passing it off as your own. This is an infringement of copyright unless you get permission from me directly. Please do not take any of my designs for submission to magazines, Design Team submissions, competitions or publication in any other form. Please respect my wishes and remember that the aim of this blog is, above all, to share ideas, inspire people and to have FUN!